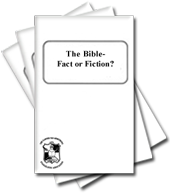 The Bible - Fact or Fiction? This table shows the correct answers to the questions for Lesson 12. The questions are generated from the doctrine on Faith. To check the text of the doctrine for each question and answer, go to the Check Text Page. 1) Faith is ________________ that God exists. a) knowing that God will accomplish what He has promised to do. b) trust in His promises. c) belief that God is in control. d) absolutely necessary for Salvation. 3) Where in the Bible do we read, "that the trial of your faith is more precious than gold." 4) Where in the Bible do we read, "law, judgment and faith are the weightier matters of the law." 5) Where in the Bible does it say: "without faith it is impossible to please God." a) the overall system of doctrine and belief accepted by the church. a) that Jesus Christ is our savior. b) that His death paid the individual penalty of our personal sins. e) items a and b only. 23) Having true godly faith guarantees I will never have doubt. True or False? a) to believe God will help us in trials if we are faithful. b) to answer every prayer that is prayed according to His will and in faith. c) to believe in God's promise of the resurrection from the dead in salvation. 27) In what New Testament book and chapter do we see a list of the fruits of the Spirit? 30) Faith can come by reading and immersing ourselves into the Word of God. True or False? (True) Note: The reason this works is because the Word of God is the mind of Christ and true faith is Christ being faithful in and through us.